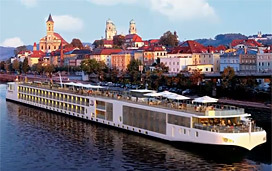 (3:35 p.m. EDT) -- Viking Cruises' new Viking Forseti damaged a power line near Forchcheim, Germany, September 23 when a crane used to move the ship's gangway got out of proper position and hit the overhead power line. The incident shut down the A73 motorway and the Main-Danube Canal. It's Forseti's third accident in a month. Viking Forseti, which launched this year, was involved in two previous accidents this month. It ran into the back of another ship when the two were in a lock together, then had a second ship run into it. No one was injured in either event, but the accidents resulted in itinerary delays. The ship was inspected for damage, according to a Viking spokesperson, which caused a delay of a few hours, before it resumed its course.